The tour begins at the Old-New Synagogue, the oldest functioning synagogue in Europe. Built around 1270, it is also among the oldest Gothic structures in Prague. Prohibited from practicing masonry, the Jews hired Christians to build the synagogue. 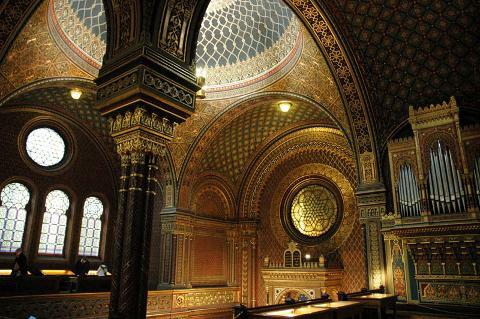 At the heart of Jewish culture and learning in Prague for more than 700 years, this synagogue serves as the backdrop for our discussion of Jewish religious and social customs during the medieval period. Visiting the Renaissance-era Town Hall built by Mordechai Maisel enables you to envision the golden age of Prague’s Jewish community. Maisel, the mayor of the Jewish Quarter who became Rudolf II’s Minister of Finance, used his fortune to pave the ghetto’s streets, support Jewish organizations and provide charity for the needy. At the same time, Rabbi Judah Loew ben Bezalel (1525-1609) was becoming legendary in Europe for his prolific theological and philosophical writings. Rabbi Loew is celebrated in Prague folklore as the creator of the Golem, a monstrous living being made from clay from the banks of the Vltava River. According to one version of the story, the Golem was created to defend the Jews from anti-Semitic attacks. 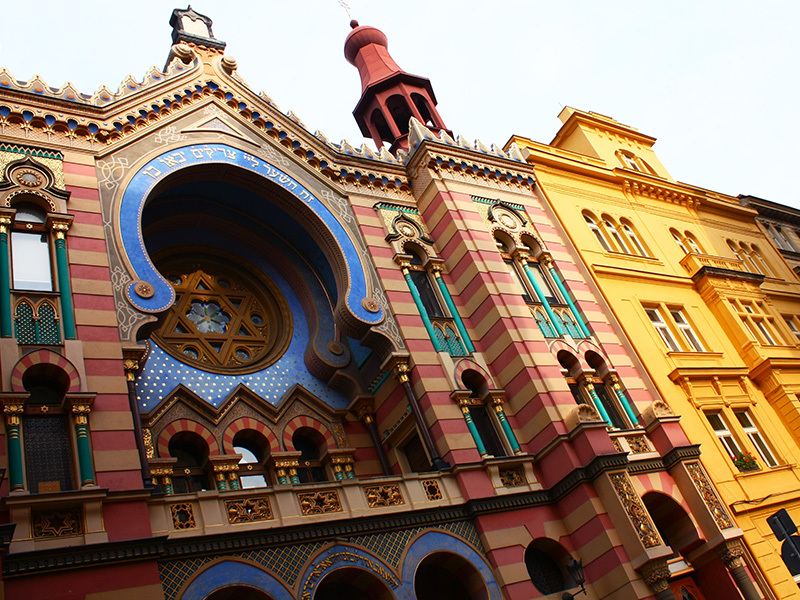 As you continue to move through one of the largest collections of Judaica in the world, the paradoxes of the Jewish experience in Prague become manifest. In 1745, the entire Jewish population was expelled by Austrian Empress Maria Theresa. Yet, only a few years later, facing a financial recession, Prague’s residents demanded their return. In 1782, Maria Theresa’s son, Josef II, issued the Edict of Toleration, granting the Jews religious freedom, eliminating professional restrictions, and allowing Jewish children to attend schools and universities. A grateful community renamed the ghetto district “Josefov,” as it is still known today. The increasing liberalism and toleration set in motion by Josef II were swamped by the genocidal nationalism of Nazi Germany. 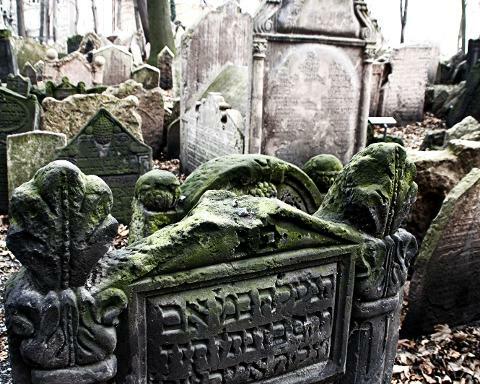 Prague’s Jewish community, at the moment of its greatest assimilation, was decimated by the Holocaust. We’ll consider the political, economic and ethnic tensions that led to Hitler’s invasion of Czechoslovakia and discuss the implementation of the Nazi’s “Final Solution” in Prague. We’ll also discuss the Jewish experience during the communist years and look at the fragile revival of Prague’s Jewish community taking place today. Note to travelers with mobility issues: Please note that this tour as regularly offered includes walking up and down stairs that are sometimes very narrow and/or steep. If you believe you will have difficulties, please consider booking a private tour so that your guide can tailor the route to your limits and personal rhythm, leaving out some sites and focusing on other sites as needed.